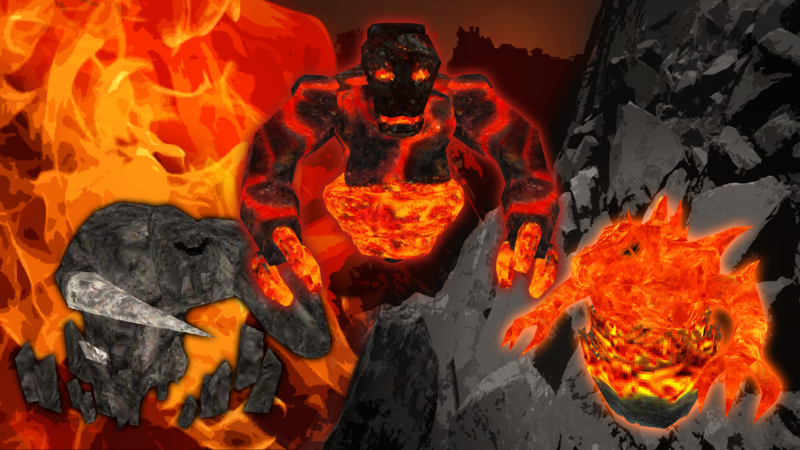 New Mob Added: Volcan - The Lava Elemental, Doesn't naturally spawn, instead it is created from melted Geonach, suffocated Cinders or from Geonach and Cinders fusing together! New Cinder Model added with new scrolling texture effect! Added new glow in the dark effects to the Spectres as well as a new Azure Spectre texture thanks to Card. Fixed a bug where the default Mob Event Spawner settings were only spawning only one mob per spawn wave making the events far too quiet, this was due to still using "mobCount" which was changed to "mobCountMin". Fixed a bug where Mob Events would always spawn subspecies. All mobs are now registered with the new EntityEntry Forge Registry. Fused minions should now be working correctly. Fixed a bug where Quetzodracls were constantly attacking their pickup target even after dropping them. Fixed a bug where JSON Spawners were ignoring the "doMobSpawn" game rule. ============================================================ Lycanites Mobs Update: Meltdown! - Version 1.17.7.0 for Minecraft 1.12.2 Configs older than 1.17.3.2 will be reset. ============================================================ -------------------- New Features: -------------------- New Mob Added: Volcan - The Lava Elemental, Doesn't naturally spawn, instead it is created from melted Geonach, suffocated Cinders or from Geonach and Cinders fusing together! New Cinder Model added with new scrolling texture effect! Added new glow in the dark effects to the Spectres as well as a new Azure Spectre texture thanks to Card. -------------------- Major Fixes: -------------------- Fixed a bug where the default Mob Event Spawner settings were only spawning only one mob per spawn wave making the events far too quiet, this was due to still using "mobCount" which was changed to "mobCountMin". Fixed a bug where Mob Events would always spawn subspecies. -------------------- Changes: -------------------- All mobs are now registered with the new EntityEntry Forge Registry. Fused minions should now be working correctly. -------------------- Minor Fixes: -------------------- Fixed a bug where Quetzodracls were constantly attacking their pickup target even after dropping them. Fixed a bug where JSON Spawners were ignoring the "doMobSpawn" game rule.